Now that performance-based fire and gas system design is becoming more prevalent, knowledge of the terms that are used to describe detector performance is also more important. Furthermore, understanding the strengths and limitations of the various detection methods (and the software that employ those methods will also become increasingly important. The term that I’d like to start with is a “cone of vision” of an optical fire detector. Subsequently, I’d like to discuss how the cone of vision can be used to create the fire coverage maps that will ultimately determine whether or not coverage targets have been achieved. A fire detector cone of vision is essentially a two-dimensional representation of the performance of an optical fire detector for a given set of conditions. A typical example of a cone-of-vision drawing is shown in the figure below. Based on this drawing, it can be assumed that a “fire” can be “seen” at a distance of 210 feet. While this is narrowly true, one needs to understand the narrow set of circumstances for which the actual fire coverage map for a detector will look like the figure shown above, as most of the time it will not. Furthermore, if you receive a fire coverage map that looks like the figure above, it was most likely created in an unsophisticated software package that does not properly address the three-dimensional nature of the cone of vision. The figure above is very specific to several factors. First, is the make and model of detector. Different detectors will have very different cones-of-vision. As such, one can not simply model a “generic” detector and expect to get results of any reasonable accuracy. Second, is the material that is being burned. In the figure above, the material of interest is heptane. Similar tests using, for instance, methane, will result in a completely different cone of vision. Third, is the fire size. The figure above is based on a 1 ft x 1 ft heptane pan fire, which generates a given level of thermal radiation. If the fire were smaller, the amount of radiation generated would decreased and thus will only be effectively seen from a smaller distance. Conversely, larger fires can be seen from a greater distance. For the fourth concern, I will combine detector elevation and detector orientation into one common concern. Since the cone-of-vision is actually a three-dimensional cone, it’s representation in a two dimensional figure will vary depending on the plane that is chosen to intersect with the cone (this should bring up some fuzzy recollection of analytical geometry and its associated conic sections). The figure that is shown above is only true when the detector and the elevation of interest, which is the single elevation for which the fire coverage map is drawn, are at exactly the same elevation. 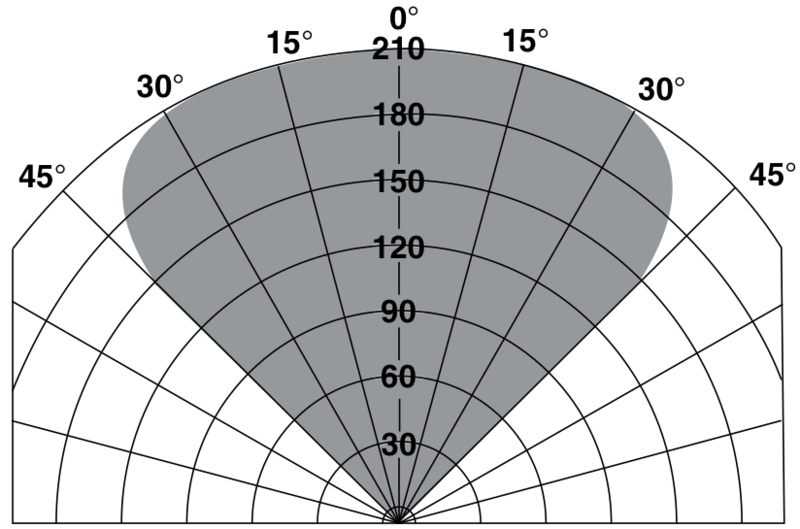 Furthermore, the detector must be parallel to grade, making the centerline of the cone of vision exactly on the plane that holds the elevation of interest. This phenomenon is illustrated in the following figure. If, and only if, all of these conditions are true will the fire coverage map generated for a fire detector match the two-dimensional cone-of-vision drawing typically supplied by an equipment vendor for their detector. In reality, most of the time a fire coverage map will not at all look like a published cone-of-vision drawing, because most of the time detector are mounted at an elevation significantly above the elevation of interest, and detectors are rarely oriented so that their centerlines are parallel with grade – instead, angling down to allow for a more comprehensive field of vision is preferred. 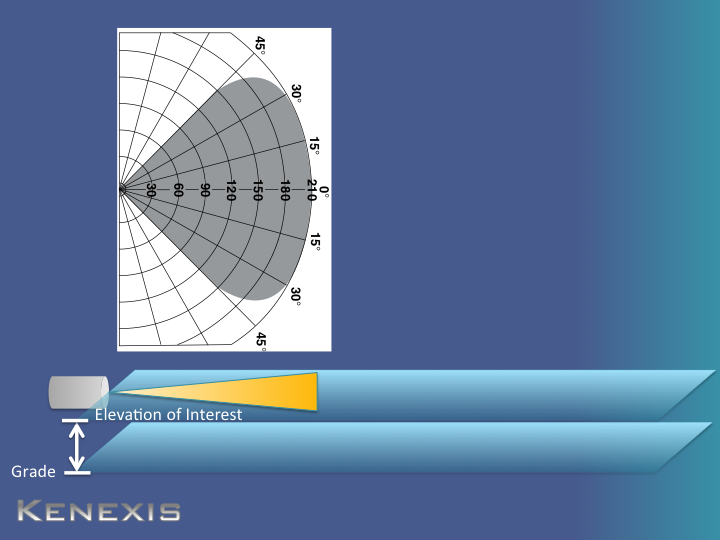 As a result of the common installation techniques, a full three-dimensional accounting of the cone-of-vision, and how it is projected onto an elevation of interest must be made. I will describe all of the factors that need to be considered and how they impact the resulting cone-of-vision projection in coming posts. As a prelude, I will list the factors that need to be considered. More information will be forthcoming… And after detectors are analyzed, I’ll discuss how obstructions can then be handled.